We simply can’t imagine anyone being less than totally enthusiastic about this TV or the company that makes and supports it. SunbriteTV SB-60HD series information: The review below is based on our hands-on experiences with the 55-inch SB-5560HD outdoor television. Our observations also apply to the three other models in the SB-60HD series. According to Sunbrite, the sets off the same features (excepting for weight and dimensions) and should offer identical performances. 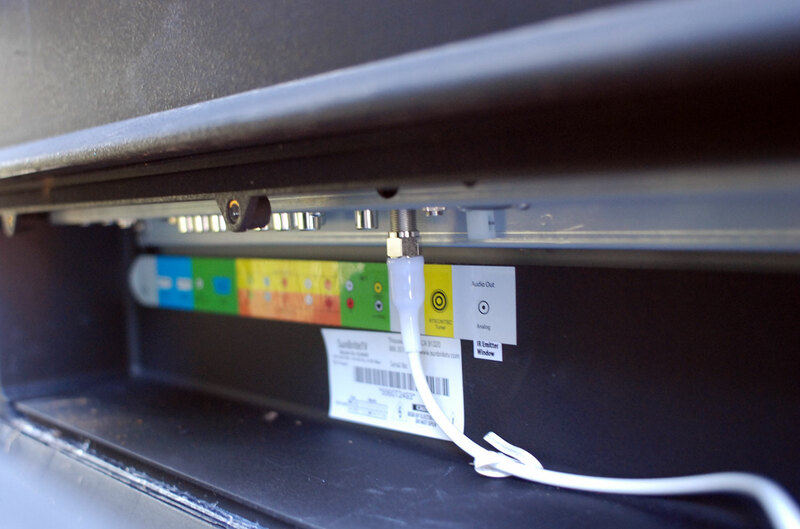 In the video below we do our best to show you just how resilient Sunbrite’s TV’s are. 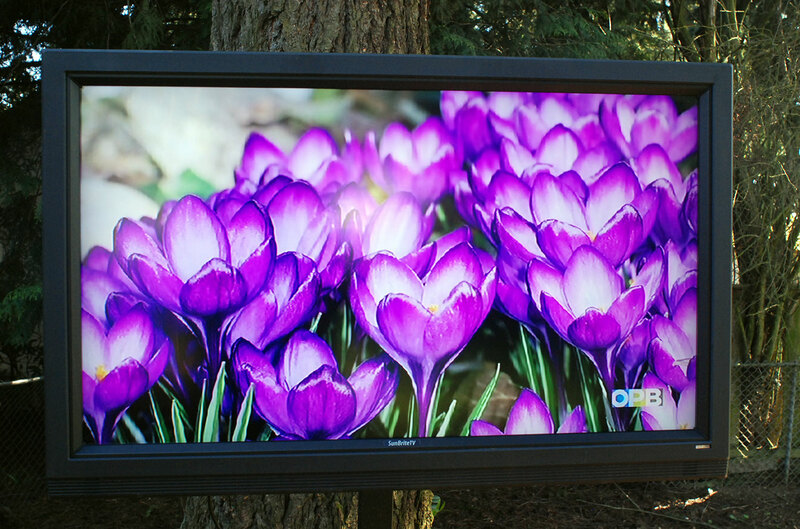 Check it out, then continue on for a slightly more conventional review of Sunbrite’s Signature Series 5560HD outdoor TV. Until a little over a year ago, I didn’t know there was such a thing as a consumer-grade outdoor TV. Sure, I’ve seen others try to rig up their run-of-the-mill LCD TVs so they didn’t fry in the fog, seize up in the cold or overheat in the blistering sun, but it came as news to me when I got a call from the folks at Sunbrite about their purpose-built, ready-to-take-whatever-mother-nature-can-dish-out TV. I finally met the Sunbrite team at CEDIA 2012, where I saw one of the company’s 46-inch outdoor TVs taking a shower on the show floor. Sunbrite repurposed some sort of water feature pump to dump water on the TV, collect it in a tray underneath and recycle it for further TV-dousing. Elsewhere in its booth, Sunbrite played a video showing the TV being “attacked” by a bear and shot at by both a paintball gun and a proper rifle. I appreciated that the company liked to show-and-tell, and thought maybe it would let me do the same as part of a review. Turns out, they did. During daytime viewing, it had no trouble competing with the sun (what little of it we got) to produce a bright, colorful image. A month or so later, an absolutely massive (and extremely heavy) set of boxes arrived at my door on a shipping pallet. The 55-inch model I received weighs in at 109 lbs., and with that kind of weight distributed over its 53.3 x 33.6 x 7.3 (W x H x D – in inches) frame, it’s more than unwieldy. Considering the 5560HD retails for about $4,000, I wasn’t about to do anything unintentional that might harm it. Nope, the smack I intended to lay down on this TV was going to be entirely intentional (and previously approved by Sunbrite, by the way, so don’t get any wild ideas). That being the case, I decided to wait a couple of days until someone could help me erect the TV on the planter pole that was supplied along with it for this review. So … that didn’t happen. Days turned into weeks, and weeks turned into months. All told, the 5560HD sat outside, secured to a homemade table stand for several months before I finally got around to conducting my “formal evaluation.” In that time the TV endured well over 40-inches of rainfall, several hailstorms, sub-freezing temperatures, a couple of windstorms that had me seriously worried about my roof (never mind the $4,000 TV), a hot tub party gone horribly awry and several suspiciously well-coordinated raccoon attacks. But, much to my amazement (and relief), it appeared that the TV was doing ok. And since spring has arrived, it was time to get serious about testing it out and showing the world just how much (mostly) real-world abuse it could handle. 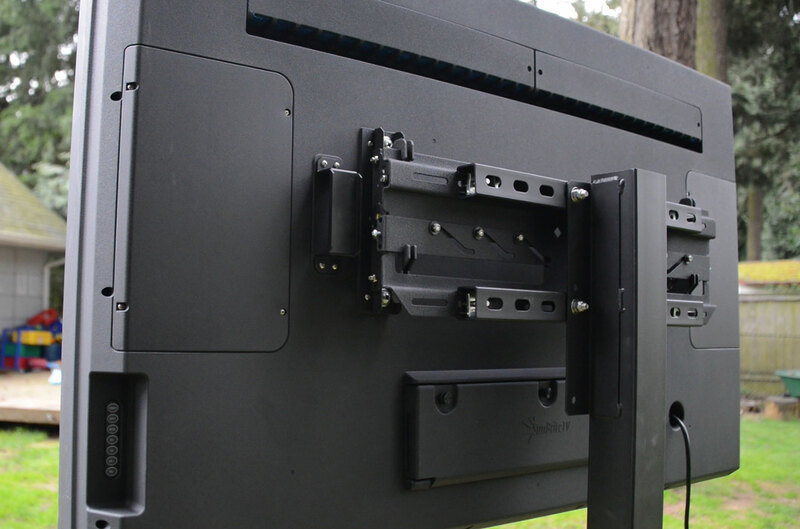 Sunbrite offers several different mounting accessories for its full line of TVs. Considering the set’s hefty weight and the vital importance that it not come crashing down due to mounting failure, I’m going to suggest sticking to the mounting hardware Sunbrite sells – particularly considering the hardware comes with a lifetime warrantee. For this review, Sunbrite sent me a “deck planter pole” and fixed mounting bracket. The company also offers ceiling mounts, wall mounts (both fixed and varying levels of articulating) and table-top stands. Customers can also purchase additional remotes, cleaning kits and TV covers, among other accessories. The assembly directions for the planter pole and fixed mount weren’t the best I’ve seen, but I figure most folks buying a TV like this will probably hire an installer anyway. In fact, I’m going to urge professional installation because not only does it take a significant weight off your shoulders (literally) it also puts some liability on the installer, should anything happen to your pricey new outdoor TV. Once my colleague and I wrapped our heads around the instructions, getting the pole assembled and the TV mounted on it was relatively easy, though certainly a two-man job. The 5560HD’s cabinet is made of a roughly textured, high-impact ASA resin – the sort of stuff that can handle a scrub brush, but will demolish a sponge. Our review sample came in black, but silver is also available, as is white (though at a $255 premium). 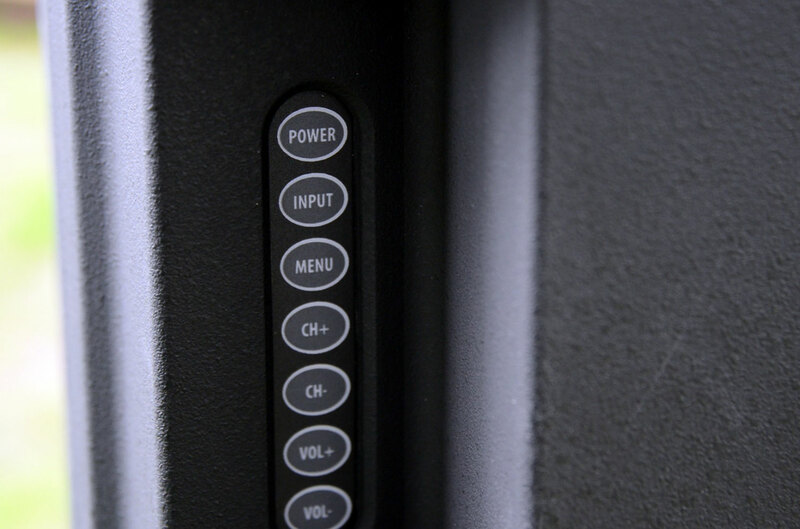 The TV’s connections are tucked away behind a long, rectangular door which is secured using three threaded knobs. 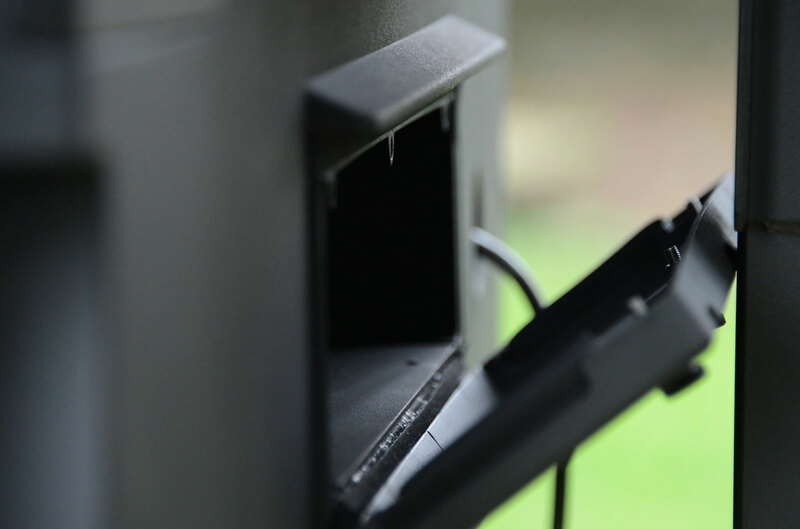 Lining the perimeter of the panel door and the TV’s cabinet is an application of foam strips which will seal around cables as the door is closed. Enough space is left on either side to route a fair amount of cabling, though we imagine only a couple of HDMI cords will be necessary in most installations. We found the cable routing system to be more than adequate at keeping moisture out. The TV offers just two HDMI inputs, two component video inputs, one each composite and s-video input, a PC input and an RS-232 port. There is a USB port in there as well, but it’s intended for factory use only. Tucked along an inset on the upper back of the TV, we found a strip of porous blue filter material. The material allows ventilation but keeps any water or small critters from entering the cabinet. We found the TV’s 20-watt, down-firing speakers at the bottom of the cabinet behind integrated plastic grills. We’re not sure what protects them from moisture, but they didn’t suffer any problems during our barrage of tests. You may have noted from our photos that this TV is bulky. That’s partly to do with the set’s CCFL backlighting system (watch out for that power bill), but also because Sunbrite installed fans inside the cabinet to keep things cool on hot days. To keep things warm on cool days, Sunbrite’s Pro and Marquee series TV’s also include heating elements inside – good enough to keep the TV’s panel from shattering in sub-arctic regions, according to the company. Both systems are activated via a built-in thermostat. Expect the standard amount of picture controls with Sunbrite’s TV’s. Naturally, there is little use for gray-scale and color-space adjustment because, frankly, most people partying in the pool or grubbing down on a rack of ribs probably won’t care if the set’s color temperature isn’t just right. Still, I appreciated the ability to warm up the set’s color a bit and tone down the brightness levels when watching at night. Sunbrite also includes a fair amount of on-board audio controls for customizing sound output. This came in handy when I moved the set from an open area to a more closed-in space. For those who need more than the set’s on-board audio can offer, digital and analog audio outputs are available to rout audio signals to another device. The remote included with the 5560HD is weatherproof and can handle pouring rain, though I wouldn’t go so far as to chance dunking it in a pool or hot tub. The remote is probably the weakest point of this TVs design. The buttons are spaced tightly, and some of the more oft-used functions such as “menu” aren’t highlighted particularly well. Also, we found that the remote’s IR signal only reached the TV when we pointed it straight on. Moving off angle rendered the remote useless during the daytime, and was only slightly more responsive at night. If things take off for Sunbrite, we hope to see future models incorporate a Smart TV platform. For now, any streaming content will need to be delivered by an OTT (over-the-top) box or Smart Blu-ray player. Clearly, Sunbrite’s TV’s can stand up to some abuse. But they can also withstand some less overt pressure. Most importantly, Sunbrite’s TV proved to be resistant to condensation, high humidity and very cold temperatures during out testing period. The company claims the TV can handle temperatures as low as -40 degrees Fahrenheit and as high as 122 degrees Fahrenheit, and resist corrosion from exposure to salty marine air. Though we were not able to test those claims, we have little reason to doubt them based on what we did observe. Before Sunbrite’s 5560HD showed up, I spent some time wondering how I would go about evaluating and describing this TVs picture quality. To what standard am I to hold this TV? Should I even bother with the tests discs and the benchmarks? Do I evaluate it on a sunny day or at night? Shouldn’t we all just be jazzed that it can sit out in the rain for months on end and still produce a picture? This is not, by purposeful design, a display meant to appease videophiles. It isn’t designed to produce inky blacks with gobs of shadow detail. It’s meant to be able to compete with the sun to bring you a vivid and colorful picture – a pretty tough trick to pull off. Sunbrite is pretty much the only player in the outdoor TV game right now. So until it gets some healthy competition (and we believe it will, sooner or later), Sunbrite sets the standard for outdoor TV performance. Still, we’re happy to offer our subjective opinion on its picture quality. More valuable than any analysis of this TVs picture performance is a narrative on what it’s like to live with this TV. How does it enhance your life? What will your friends and family think? The 5560HD’s performance exceeded our expectations. During daytime viewing, it had no trouble competing with the sun (what little of it we got) to produce a bright, colorful image. On overcast days, I noticed a slight oversaturation of colors, with red standing out the most. Adjusting color, color temperature and tint settings helped a little, but I always felt like red was a little on the hot side. At night, the 5560HD was dazzling. With a little adjustment, I was able to achieve some impressive black levels and contrast. Shadow detail was never particularly great, but it took a night of intentional sobriety and intent eyeballing to figure that out. Otherwise, the 5560HD spent the lion’s share of its time as the ultimate party and entertainment accessory. We watched NCAA basketball while smoking a brisket, Disney movies while having dinner and dessert at the picnic table, a romantic comedy while potting plants, and a UFC fight while…well, I promised never to discuss the Hot Tub snafu, so let’s stop there. The point is: The TV was an enhancement to our outdoor experience, not a distraction. We didn’t turn it on every time we ventured outdoors, but it was nice to have the option. Moreover, not once did anyone have anything but wildly positive things to say about the TV. There were certainly no discussions about a lack of shadow detail. From where I sit, an outdoor TV must meet two essential criteria: It must stand up to the elements, both natural and not-so-natural, and it must produce bright and beautiful images on even the sunniest days. Sunbrite’s 5560HD met both qualifications with ease. Furthermore, the 5560HD looks great without regard for its intended use, even at night when fine details are much easier to see. Hanging out with this TV was terrific fun, and not just because I got to throw things at it. 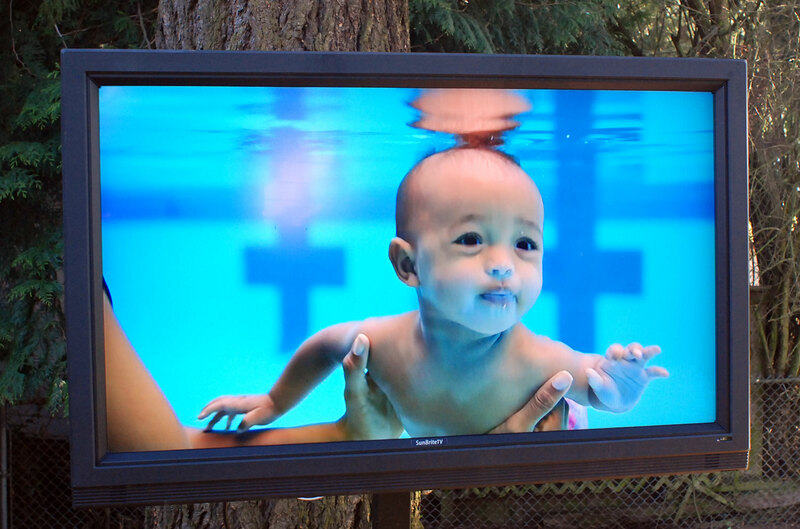 The Sunbrite TV is a bright, beautiful enhancement to outdoor entertainment and relaxation. I simply can’t imagine anyone being less than totally enthusiastic about this TV or the company that makes and supports it.